Rodarte couture label designers Kate and Laura Mulleavy wrote and directed this style over substance feature film starring Kristen Dunst. Moody and highly embellished visual light show with lingering moments of Dunst playing woodland fairy in the big trees, commonly called Woodshock when one is enraptured by the Sequoias. Distribution company A24 which steered Moonlight all the way to the Oscars gives this film some cache and viewer consideration. However the ending product is like a David Lynch film but without the quirky characters. Dunst plays Theresa who works in a marijuana dispensary in Northern California. Her boss Keith (Pilou Asbaek of “Game of Thrones”) has been experimenting creating a product that helps those clients seeking euthanasia. Theresa's mom who is dying of cancer asks for her daughter's assistance to end her suffering. So she doses her usual medical marijuana joint with the mysterious concoction. This sends Theresa on a downward spiral of guilt and grief. Theresa lives with Nick (Joe Cole) who is a lumberjack. They were not getting on very well at this point and the loss of her mother makes her more distanced from him. 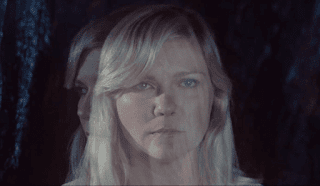 Her disintegrating personality takes on a hallucinating dreamscape with Dunst channeling her character in Melancholia. Theresa wanders about her house staring into space, playing with glass facets in the sunlight. She is like those young women in the 60's who are not tightly wound up. If there is a message in this film, because dialogue is at a minimum and reality is questioned, it may be excessive drug use, the lumber industries destroying forests and of course, euthanasia. Theresa at one point puts the deadly drug mixed pot into some of the bottles sold to customers. She also begins to smoke the tainted drugs too which would explain her nightly excursions building a wood fence in front of her house using random wood pounded with a rock. One thing is the slip she wears of her mother's while doing this construction. In fact all those costumes and set decoration have very retro hipster affectations. It's all pretty and nice to look at, but not much to think about.